Bárbaro Cavernario is the current champion. He defeated Atlantis on November 6, 2018 in Arena Coliseo Guadalajara to win the championship. In 2007, the Luchas 2000 magazine published a detailed and researched title history of all the Mexican National championships. For most of the titles, the histories printed in the magazine mesh with the information already available. This championship was an exception, with many people previously thought as champions removed and others added with multiple reigns. We believe the version below is the current one, but respect Luchas 2000's research in this area. Some changes from the Lucha 2000's research has been added to this page. The portions of disagreement in Luchas 2000's research are presented on their own page. 41th change: Near the start of AAA, Mascara Sagrada lost this title to Universo 2000 via DQ. Universo's corner man, Cien Caras, liberally interfered in the matchup. Sagrada's second, Super Star, refused to stop Cien Caras. Perro Aguayo Sr. came to the ring to help out Sagrada and replace Superstar, but was caught fouling Universo 2000 for the DQ. In the mid 2000s, the Mexican National Light Heavyweight championships was the only active Mexican National title to not to be a part of one of the two big promotions. Up until 2002, it was part of AAA's title belts, but Dandy kept upon leaving the promotion. This belt became a central championship during the short run of the ENSEMA promotion, including the LA Park title win and following loss, but went back to being an independent title when the promotion went on a long hiatus. While Vangelis was proclaimed to have won the belt from Dandy, it's not clear that an actual match happened. There's no other record of a show happening on that location, on that date. It's quite possible Vangelis simply bought the belt off El Dandy. In turn, Vangelis appeared to lose the championship to Mistico in exchange for gaining a position in CMLL. By that point, it was very rare for Mistico to wrestle independent wrestlers on spot shows, and the title match occurred during a stretch where CMLL was pushing the number of championships Mistico had won. After the title change, Vangelis joined CMLL, explaining he was looking for a rematch. When he first came to CMLL, Vangelis was consistently scheduled at a much lower level than Mistico, making it unlikely such a match would actually occur, and impossible for Vangelis to actually complete his goal. Over time, and due to an association with Texano Jr. & Terrible, Vangelis finally got into trios matches with Mistico, but never got an opportunity for a rematch while Mistico was champion. 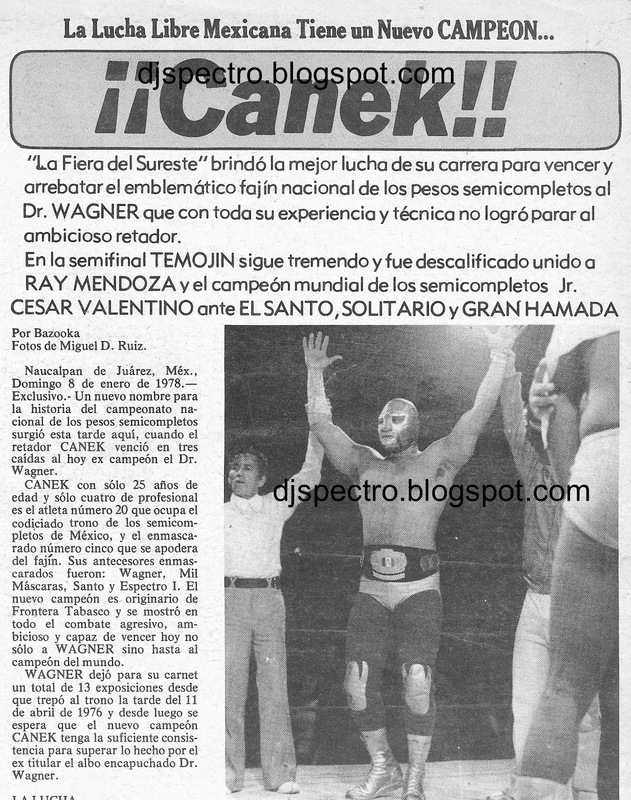 Mistico has posed for pictures wearing this championship, but did little more for the first year and half he was champion. At the time, Mistico also held many other championships, which were better regarded and defended more frequently. In 2009, after Mistico had lost most of those championships, the Mexican Light Heavyweight belt became his primary belt for title matches. In early 2010, Mistico broke with long time partner Volador Jr. and embraced many rudo tactics. After Volador was able to use Mistico's own move against him on February 5th, the two agreed to a title match the following week. This time, Volador was able to reverse a Mistico pin into one of his own, and grabbed the ropes to hold on for the victory and title change. Mistico, angry about being cheated, attacked both Volador and referee Tigre Hispano after the match, and absconded with the championship belt. Even with the physical belt, Volador was singles champion for the first time in his career. Mistico was eventually forced to give back the championship, but joined the rudo side for a few months. The entire concept of the turn was shortly waved away as Mistico only teaming with the rudos to face Volador, then switched around to Volador suddenly becoming a rudo to fight tecnico Mistico. This led to a short feud between recent tag partners Volador & Sombra, where Volador retained the title. Volador also won the CMLL Torneo Bicentenario, the biggest win of his career so far. Volador had another short feud with La Mascara. On a fan appreciation show in October, Mascara got his title match, and surprisingly won the championship. 1 Black Guzman ? 1943.03.?? ? 2 Gorilla Ramos Black Guzman 1944.09.20 ? 4 Black Guzman  Tarzan Lopez 1945.01.?? ? 5 Tarzan Lopez  Black Guzman 1947.04.12 ? 7 Enrique Llanes Cavernario Galindo 1950.12.?? ? 8 Tarzan Lopez  ? 1956.09.09 ? 17 Espanto I  Alfonso Dantes 1965.02.15 Monterrey? 25 Raul Mata Angel Blanco 1969.10.07 ? 41 Luis Mariscal Valente Fernandez 1986.04.06 ? 57 Mascara Sagrada (Alebrije) Pierroth Jr. 1998.??.?? ? ↑ Historically listed as 1966.10.14; Lucha Libre 12 has the 1965.12.02 date. Following issues of Lucha Libre refer to it as happening in Tijuana. This page was last edited on 10 April 2019, at 08:17.